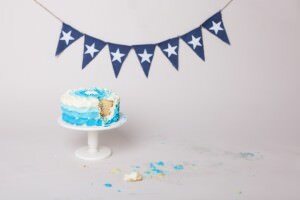 Looking for a cake smash in Edinburgh? Then look no further! 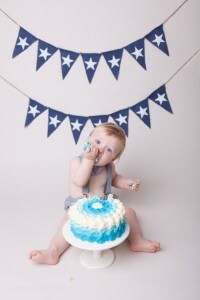 Many people contact me interested in a cake smash but a little unsure of what to expect or what is actually involved. 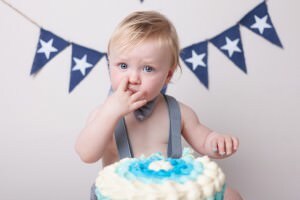 So when Sam came along to the studio for his 1st birthday smash I asked him Mummy if it would be okay for me to blog about his session and share some of his images to answer some of the most commonly asked questions about this fabulously fun kind of shoot! One of the first things people generally want to know is what age are these sessions suitable for? 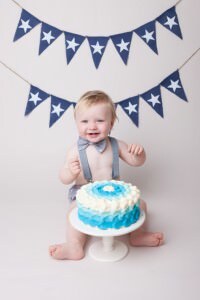 As they are typically done to celebrate a first birthday clients often choose to book their cake smash photoshoot in advance of when their baby’s 1st birthday at around 10-11 months of age. 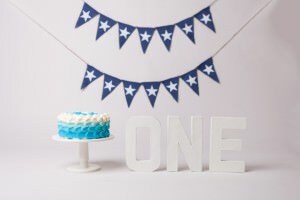 That way they have time to use the images for 1st birthday party invitations and thank you cards. however this is a personal choice and by no means the only option! 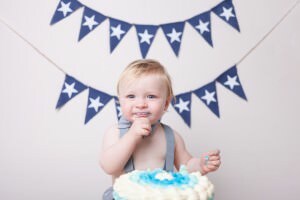 Some opt to book the session for the child’s actual Birthday so they have a fun memory of the day captured in gorgeous photos they can look back on for years to come. Some people get caught up with other plans and don’t get around to the smash until after the birthday has passed and that’s absolutely fine too! 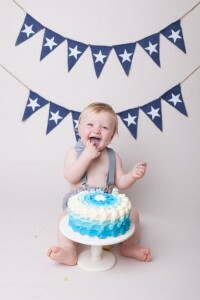 Equally I have helped families to celebrate a 2nd or 3rd Birthday with a cake smash or tea party. These can include favourite toys and take place in the studio or outdoors if preferred. So what does a cake smash involve? Well if you book one with Beautiful Bairns it will comprise of 3 parts. 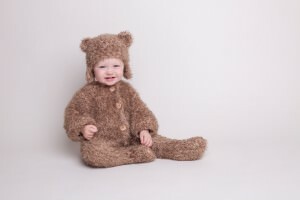 First of all we will take gorgeous classic portraits of your child in either your own clothing or wearing clothing I have in the studio (I have a selection of dungarees, knitted outfits, tutu skirts and lace rompers) which show off their personality and allow your child to relax in front of the camera and feel comfortable in the studio. We then bring in the cake and there is the option to change outfits. 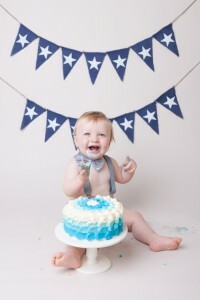 Typically your baby will spend around ten minutes exploring and eating their cake, most babies don’t eat much but love to smear the icing on themselves, the floor and quite often me! parents are recommended to bring a change of clothing for themselves as it can get messy for all involved! Once your child has been cleaned up and the cake has been cleared away (parents are welcome to take home any left overs depending on how much smashing has taken place!) I will bring in my gorgeous roll top bath for some bubble bath fun! 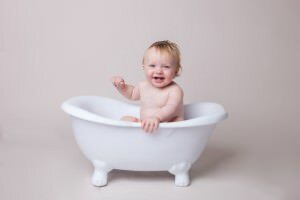 For safety reasons no water is used in the bath only bubbles so your child is safe at all times. I have baby bubble bath in the studio but if your child has any skin sensitivities or allergies you are welcome to bring your own from home. All of this is quite an adventure for your little one so most babies have a nice long nap after and you can enjoy some peace and quiet and reflect on the magic year you have had. For Sam’s cake smash his mummy and I discussed the colours and patterns we had used in his previous photoshoots with me and also the theme of his bedroom and chose these gorgeous outfits and bunting. His cake was then made to order to compliment the colours and star theme and I think it all came together gorgeously! 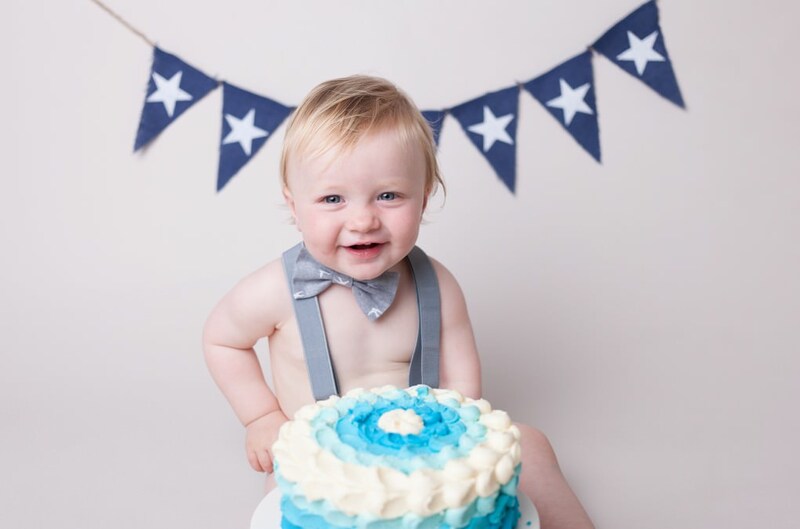 If you’d like to chat about a birthday cake smash for your own little one then please get in touch! 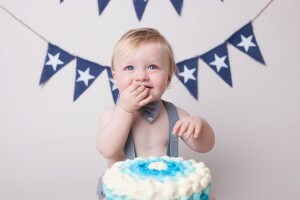 Hi I was wondering how much it costs to do the baby cake smash for my sons 1st birthday?